See also Misuzu Kōgaku Kōgyō (三鈴光学工業), a camera maker which was certainly unrelated. Misuzu Shōkai (i.e. Misuzu Trading Company) was a Japanese distributor, based in Tokyo, Ginza, from 1922 to the mid 2000s. The company was founded on June 1st, 1922 as simply Misuzu Shōkai (美篶商会). It was selling field and studio cameras in the 1920s (see below), as well as other photographic supplies. It used the brand name CH for various products in the 1920s and 1930s. The company became K.K. Misuzu Shōkai (㈱美篶商会) on May 16th, 1936. In Spring 1937, it introduced the Midget, Japan's first successful subminiature camera. The company sold other cameras under its own brands, and distributed cameras until 1944; at that date, it had shops in Tōkyō, Nagoya, Sapporo, Ōsaka, Kyūshū and Seoul. After World War II, Misuzu advertised cameras again from about 1947 to the early 1950s. On June 24th, 1965, it changed its name again to Misuzu Shōkai K.K. (美スズ商会㈱, abandoning the kanji character, whose reading is hard to guess). The company was still in existence in 2004. The website of the company said that the Midget was made by Misuzu itself. Misuzu Shōkai advertised field and studio cameras in the 1920s and 1930s. The advertisement in the November 1924 issue of Ars Camera lists two different studio cameras in yotsugiri format (25.4×30.5cm). The less expensive one, at ¥250, has four standing legs and is pictured in the advertisement. The more expensive one, at ¥450, has two standing legs. 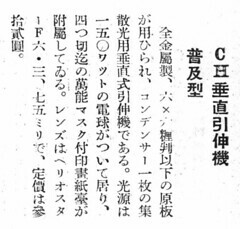 The latter probably corresponds to the Misuzu studio camera model A (ミスズ写場用暗函A號) pictured in the December 1926 advertisement in Ars Camera. The February and November 1927 advertisements in the same magazine show the four-legged model again, called Misuzu model D (ミスズD號) and the Jupiter (ジュピター號) field camera. The March 1928 advertisement in Asahi Camera shows the Jupiter and the Misuzu model A. As of 1936, Misuzu Shōkai was advertising smaller kabine-size field cameras under the CH brand, notably shown in the April 1936 advertisement in Asahi Camera, reproduced below. They were available with either double or triple extension bellows, respectively priced at ¥25 and ¥30, including three plate holders and a tripod. The CH brand was also used on a few cameras (see above). ↑ Its address from 1939 to 1944 was Tōkyō-shi Kyōbashi-ku Ginza 8-chōme (東京市京橋区銀座八丁目). Source: advertisements reproduced in Kokusan kamera no rekishi, pp.96 and 102. ↑ Chronology of the Misuzu official website (web archive version Sep 24, 2004). ↑ Midget page of the Misuzu official website (web archive version Sep 24, 2004). ↑ Advertisement in Ars Camera November 1924, no page number. ↑ Advertisement in Ars Camera December 1926, no page number. ↑ Advertisements in Ars Camera February and November 1927, no page numbers. ↑ Advertisement in Asahi Camera March 1928, no page number. ↑ 10.0 10.1 10.2 10.3 10.4 Advertisement in Asahi Camera April 1936, p.A103. ↑ Item observed in an online auction. ↑ 12.0 12.1 12.2 Advertisement in Asahi Camera December 1936, p.A107. ↑ Column in Asahi Camera October 1936, p.685. ↑ Column in Asahi Camera October 1936, p.686. ↑ Name inferred from the katakana スペンダー (supendā). ↑ Advertisement in Asahi Camera September 1937, p.A128. Asahi Camera October 1936. "Atarashii kikai to zairyō" (新しい機械と材料, New equipment and machinery). Pp.685–6. Nihon Shashin Kōgyō Tsūshin (日本写真興業通信). Hyaku-gō goto jūkai no kiroku (百号ごと十回の記録, Ten records, every hundred issues). Tokyo: Nihon Shashin Kōgyō Tsūshin Sha (日本写真興業通信社), 1967. No ISBN number. Advertisement on p.78, corresponding to the back cover of the February 15, 1944 issue. This page was last edited on 26 April 2019, at 05:42.